Katja O’Brien is one of our fearless classic designers who contributed to the transformation of the Seattle Showhouse hosted by ATGStores.com. Katja was responsible for the charming girl's bedroom, which she approached with her seamlessly chic and glamorous signature style. The homeowners have a 12 year old daughter who was ready to update her bedroom. See before photo below. 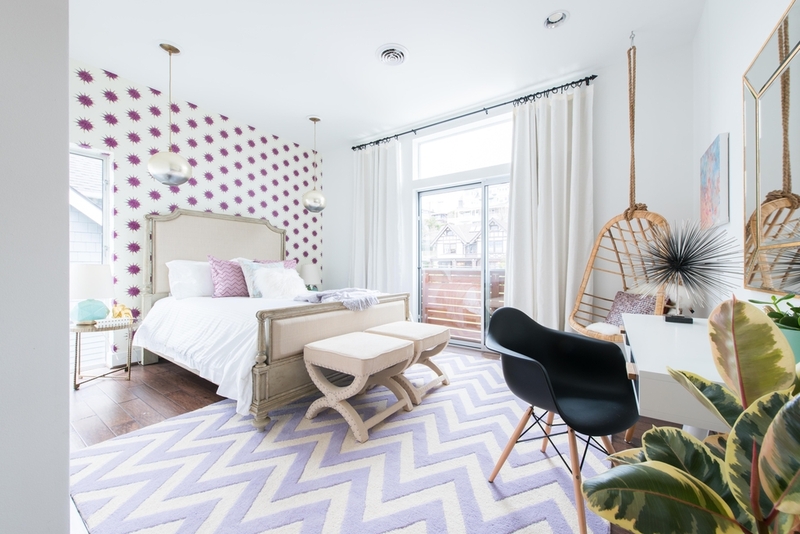 Katja's objective was to create a room that was youthful but also sophisticated and timeless. Here is Katja's design board. As you can see, the results we're stunning and the homeowner's daughter absolutley loved her new space. In today’s blog, Katja shares her tips and tricks for pulling it off. You can even shop the look here. Work directly with Katja by booking a classic design project with her today. Katja is in high demand so don't hesitate! When it comes to updating your tween’s room, invest in a classic, quality bedframe or headboard. A timeless, good quality headboard will anchor the room and seamlessly scale with your child for years to come. Try a hanging rattan chair that is both functional and whimsical. It’s a cozy little spot to do curl up and homework, listen to music or catch up with friends. A piece like this keeps the room feeling young and playful while remaining stylish. Accessories and artwork are great and affordable way to add color, express personal style and passions. When your child grows older and his or her taste evolves, you can trade these pieces for something more topical and updated. Wallpaper adds design and creates a truly signature space. I recommend choosing one focal wall and adding a graphic wallpaper rather than going to the usual paint route. Bedding is a great way to incorporate color and build texture. Use accent pillows to reflect your tween’s favorite colors and switch them out when she’s a little older and looking for a more sophisticated look. An area rug at the end of a bed is a fabulous way to add warmth and texture. It can easily be switched out to reflect your child's evolving aesthetic. Ottomans are versatile and great looking. Not only do they add color and style, but also they serve as extra seating for friends and storage for seasonal clothes and linens. 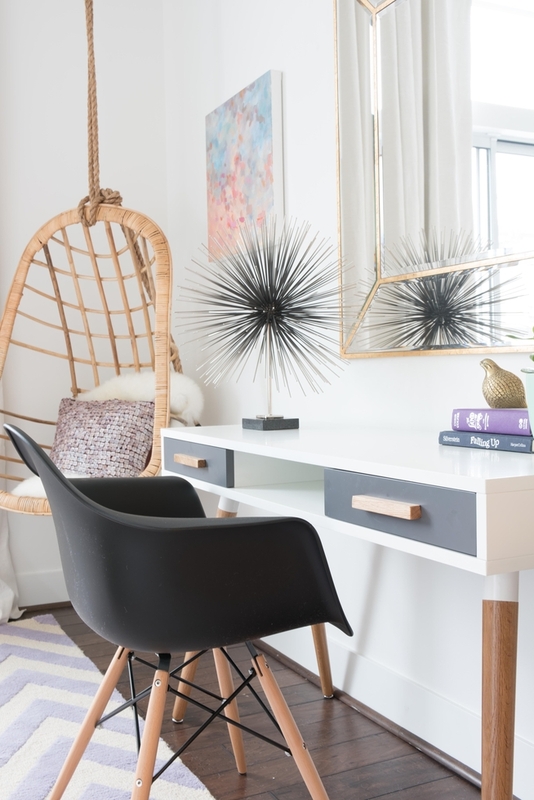 A modern minimalist desk creates an inspired spot to study. Add a comfortable chair in a vibrant color and blend in warm woods to keep the space feeling inviting. If your tween loves a certain color, add variations of that color into her room. Matching everything up perfectly isn’t necessary, but colors should be cohesive. A cohesive color palette is easier to work with down the road when you’re ready for the inevitable refresh. 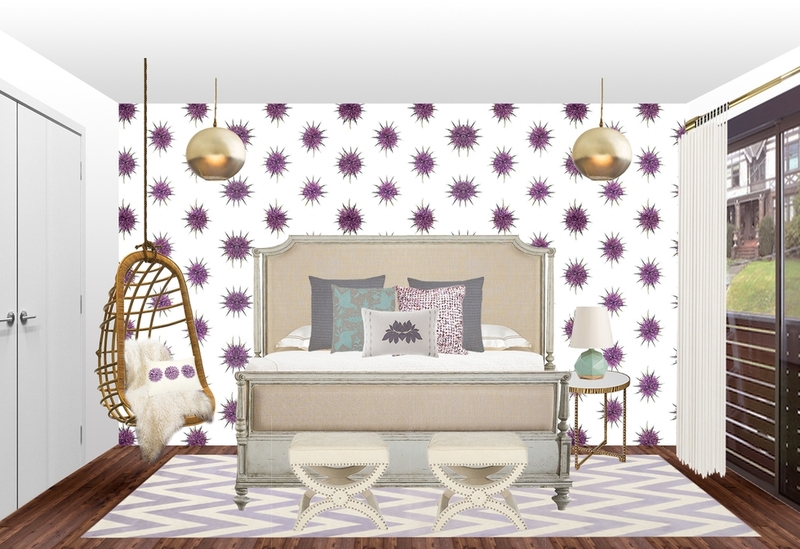 Katja designed this space entirely online! Start your Decorist Design Project today and see your space transformed.